AKIPRESS.COM - On June 29, Mongolians will cast their vote for a new parliament, the State Great Khural, for the seventh time since the country’s first democratic election in 1992, according to The Asia Foundation. By Meloney Lindberg, the Asia Foundation’s country representative in Mongolia, and Amarzaya Naran, the Foundation’s deputy manager for Governance Programs there. The election process in Mongolia has always been reasonably free and fair with no concrete evidence of electoral fraud, and with a relatively high turnout. However, since the 1992 election when voter turnout was 95.6 percent, turnout has consistently dropped in subsequent elections, reaching 67.3 percent in the last election in 2012. While low turnout is a concern, the most contentious issue surrounding next week’s election are late changes to the election law that include rejecting the party list system. The 2012 parliamentary election was contested with a mixed electoral system that included both proportional representation through a “party list” and a majoritarian system or “first past the post.” On April 21, 2016, Mongolia’s Constitutional Court rejected the use of party lists that determined 28 of the 76 seats of parliament in 2012. The court argued that the party list system violates the rights of citizens to directly elect their representatives. Less than two months before the election, on May 5, 2016, the parliament adopted the court ruling and amended the election law to remove the party list system and return the election system back to a full majority. Some worry that this change, coupled with a short campaign time of only 17 days, may favor incumbents or members of the major political parties and limit the space for independents and smaller political parties that will have an abbreviated time to be heard by the voters. Changes in the law also led to the last-minute remapping of electoral districts and allocation of 76 seats. Overall, 48 mandates have been assigned to 21 aimags (provinces) and 28 to the capital city. When the Mongolian parliament approved the gender quota for candidates of at least 30 percent in 2012, it was praised as a progressive step. However, as part of changes to the election law, parliament decided to decrease the gender quota to 20 percent in this election, even though the change had not been included within the Court decision. 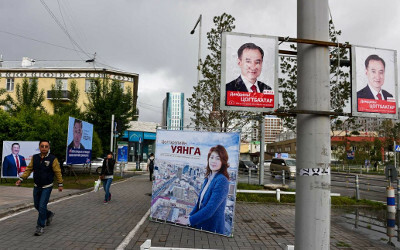 Both major parties, the Democratic Party and the Mongolian People’s Party, nominated 17 and 16 female candidates, respectively, as required by the law. This year, 69 independent candidates are running – the highest number ever. According to the Sant Maral Foundation’s annual Political Barometer released in March 2016, more than one-third of the public (31.9% in the countryside, 39.4% in the capital city, Ulaanbaatar) responded that none of the major parties can best solve their problems. The survey also reveals a high percentage of undecided voters, at over 40 percent, which could mean that smaller parties have a better chance at influencing voters’ decisions during the campaign, which officially kicked off on June 11. One feature of Mongolia’s election law is that all campaign activities must end one day before Election Day. This clause has been strongly enforced in past elections and tends to leave everyone to wonder in amazement at how all the posters and billboards on the city streets and buildings can vanish overnight. Coinciding with the parliamentary elections this year are elections for Ulaanbaatar’s City Council. An unprecedented 286 candidates are running, vying for just 45 seats. As Ulaanbaatar’s population rapidly increases, the importance of running the capital city government is becoming more pronounced. Although allocated only 28 seats in the national government, the City Council is seen as more directly representing the priorities of Ulaanbaatar citizens, who now make up nearly half of the country’s entire population, given its power to manage day-to-day issues as well as develop investment, infrastructure, and environmental policies city-wide. The Mongolian General Election Commission (GEC), which serves as the main government body to organize elections, has faced enormous challenges due to these late changes in the election system, which has resulted in an even more expensive election than planned. The GEC has done a fair job in the areas of online checks of voter registration, as well as checks of party platforms together with the National Audit Agency against their fiscal feasibility so that candidates would not include promises of large cash handouts in their party platforms. During the 2008 election, campaigns competed for who could promise the most cash to voters – two major parties promised to share the country’s mineral wealth with citizens through cash handouts of $500 and $750. Candidates are now barred from making election promises about money or employment. However, the GEC has struggled to sufficiently educate citizens on the electoral system and how to compare party platforms and distinguish between the different candidates. Voters currently do not have easy access to standardized information on candidate profiles, including past offices held or proposed policies. While parties technically make information about platforms and candidates available, making this information more easily accessible and publishing standardized and unbiased information through voters’ guides would be a tremendous help. Although these changes present challenges as Mongolia’s democracy transforms, the country has a significant history of free and fair elections that will likely carry it forward. As Mongolians head to the polls next week to decide who will run their country for the next four years, it is important to recognize that, despite historical election day stability, reformers inside and outside government should not abandon efforts for improvements in the transparency and efficiency of the electoral process.